22 March is World Water Day, an annual United Nations observance event that draws attention to the urgency of establishing sustainable fresh water management systems in all parts of the world. ERGA plays an important role in helping African communities to access crucial water resources. Our company invests between $5-6 million in CSR initiatives across Africa every year, with strong focus on the construction of solar-powered water supply installations. Over the last few years, we have established sustainable water supply systems for many communities facing significant, ongoing water challenges. The UCK Township community near Metalkol RTR has lived without access to potable water for more than 21 years. The people of the UCK Township survived by digging shallow wells along the Musonoi River Valley, and by collecting water from infiltrations at Kingamyambo Tailings Dam, or from the Dilala River waste water system. The potability of that water though, has always been a huge challenge. During the Participatory Rural Appraisal performed by Metalkol RTR in this community, access to potable water was ranked as the second biggest challenge community members wanted to tackle. 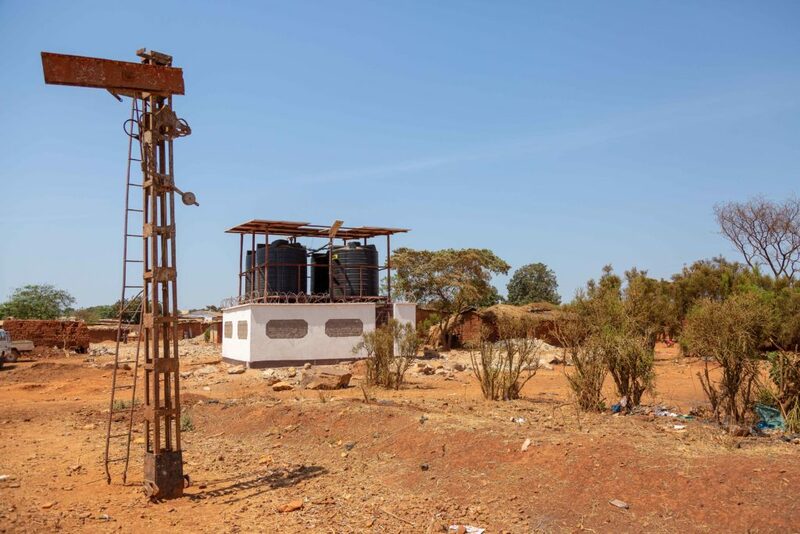 Metalkol RTR proposed measures to solve the water access issue, including the drilling of a new borehole and equipping it with a solar panel-powered pump. A water co-operative was also formed to manage and maintain the new water distribution system. UCK Township now has access to a water distribution system for cooking and drinking, which provides a minimum of 20 000 litres of clean water per day. The Lubembe River is a key water source in the Sakania area, and recently this vital resource has dried up to a worrying degree, placing pressure on local communities. Frontier Mine engaged with the Zambian National Commissioner for Rural Development, the Provincial Minister of Mines, and representatives of civil society to address this dynamic. Following the initial stages of the engagement, ERGA commissioned a comprehensive environmental impact study to scientifically assess the changing water dynamics in the region. Once the results of the study have been finalised, Frontier Mine will design and implement a water supply system solution, which is clearly critical to the well-being of the local community. In the interim, the mine is taking remedial action on behalf of the local community, including the repair of eight water pumps, the drilling of three additional wells with a double distribution system and the implementation of three large diameter wells, capable of supplying more than 400 m3/hour. The mine has also rehabilitated four boreholes in the Sakania vicinity, equipping some of them with solar panels. The Kafue River is a crucial water source within Zambia’s Copperbelt province. Chambishi Metals has established a permanent water supply line from the river to Chambishi Township, ensuring residents have reliable access to this essential life resource. ERGA will continue to work in partnership with local communities and other relevant stakeholders to improve access to water in our areas of operation. We are rightly proud of the positive impact our efforts have had on the quality of life of local communities, and we have no doubt that in maintaining our focus we will continue to play an important role in the resolution of this crucial global challenge.